This morning when I went into the greenhouse I brought the bugs in with me. Thousands of them. No I am not losing it- I am just trying out something new. Carnivores on a mini-scale. It all started last week. I saw a single little black fly zooming above me as I approached to water a tiny seedling tomato. A single black fly. Not a hovering mass. I got right on the phone and ordered fungus gnat predators. In the past I have used nematodes to kill off fungus gnat larvae but this time I was going to try something new. 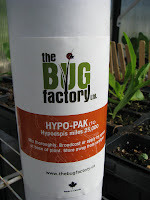 My one litre hypo-pak came complete with 25,000 Fungus Gnat predators or Hypoaspis miles (also known as Stratiolaelaps miles). This little carnivorous insect eats other small insects and is harmless to people. The added advantage over using chemicals is obvious to me. It means my greenhouse is pesticide free. The advantage over nematodes is that Fungus gnat predators also eat thrips and red spider mites. While most gardeners don't see thrips, they are often there in wet soil eating away at the roots of your plants, making them susceptible to damage from disease and drought. 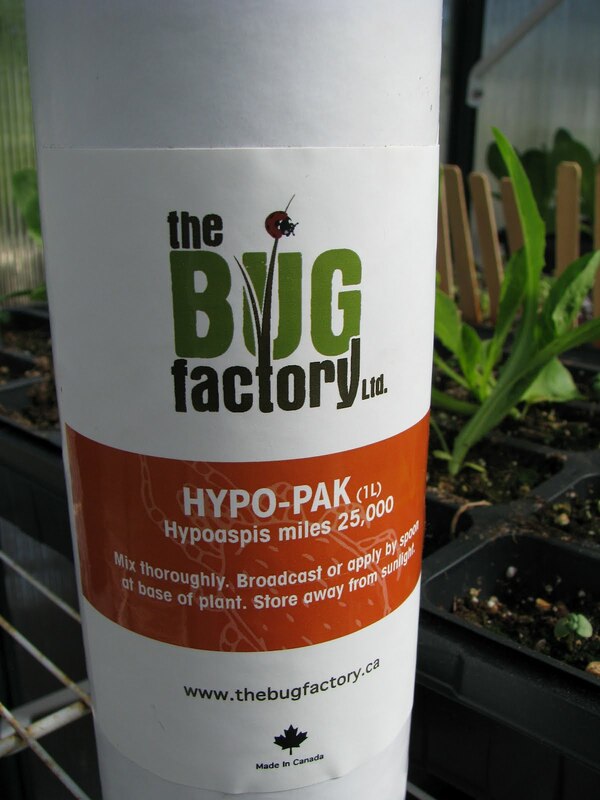 Natural Insect Control (NIC) in Ontario is a retail outlet for biological controls and they ship across Canada. The Bug Factory in Parksville is strictly wholesale but they directed me to a retail outlet and I drove over to pick up my precious cargo. If you go into the greenhouse today you are in for a big surprise. Well, honestly you wouldn't notice it but the little bugs are now hard at work for me in their little piles of vermiculite. It was chilly in the greenhouse today so I turned up the heat a bit. I don't want my bugs getting cold and working at less than their optimum speed. And, yes, I do feel a bit foolish fiddling with nature this way but a greenhouse is hardly nature and I don't want to be inhaling clouds of fungus gnats in two weeks. Instead, my plants will continue to grow in a stress free way as I watch and wait for that first tomato harvest which is only 120 days away now. I hope. I wonder if this might be what I have in my huge pot with my Apple tree. There are literally hundreds of them tiny tiny little bugs just running around in the pot. They aren't touching the plants. They just go nuts when I water though.